WELCOME TO THE DECEMBER EDITION OF THE GO LOCAL. GO TEXAN. E-ZINE. If you’re a true red, white and blue Texan, then you probably own a pair of cowboy boots, or two! That’s why I think you’ll enjoy the feature story in this month’s Go Local. GO TEXAN. issue. 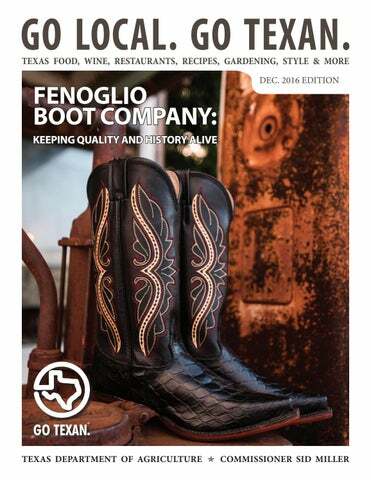 It’s all about our friends the Fenoglio Boot Company — a great custom bootmaker in Nocona, Texas. We enjoyed having their team put on custom boot-making demonstrations at the State Fair of Texas this year. Inside this issue, you’ll get a glimpse into the boot-making process, as well as a link to tips on what to look for when buying a pair of cowboy boots and caring for them. will make you appreciate Texas grapefruit even more. If you’re hungry, we have a feature on Joe Daddy’s in Amarillo and a fantastic recipe for venison with Texas pecans. As we head into the holiday season, I’d like to wish you a very Merry Christmas. I hope you get to spend time with your family and friends. In this issue, we have highlighted several holiday events all over the Lone Star State, so get out and enjoy all that Texas has to offer this holiday season and beyond! FENOGLIO BOOT COMPANY: KEEPING QUALITY AND HISTORY ALIVE WHEN YOU DRIVE INTO THE TOWN OF NOCONA, TEXAS, THE WELCOME SIGN PROCLAIMS IT AS THE “LEATHER GOODS CENTER OF THE SOUTHWEST.” THE TOWN ENJOYS A FINE REPUTATION AS AN EXPERT AND QUALITY BOOT-MAKING CENTER, AND FENOGLIO BOOT CO. IS ONE COMPANY HELPING TO CARRY ON THAT TRADITION. FENOGLIO BOOT CO. HOSTED A BOOT-MAKING DEMONSTRATION AT THE STATE FAIR OF TEXAS A COUPLE MONTHS AGO, AND WHILE HIS COMPATRIOTS AND CO-WORKERS HAMMERED, STRETCHED AND STAPLED PIECES OF LEATHER OVER ANVILS, CAIDEN FENOGLIO PRIVATELY SHARED SEVERAL BOOT-MAKING DETAILS WITH US ON THE SIDE. THIS TIGHT-KNIT COMPANY LOVES THE ART OF MAKING COWBOY BOOTS, AND IT SHOWS IN THEIR CRAFTSMANSHIP. individual steps. Fenoglio Boot Co. has nearly 60 employees who make between 200 and 250 pairs on any given workday. us an inside look at the process. It’s not just how Fenoglio boots are made, it’s important to point out the value of the materials being used. This is what separates the cheap, massproduced knock-offs from the longlasting handcrafted variety. For a more in-depth look at what to look for when buying a pair of boots, as well as a care guide, read our indepth story on the Fenoglio Boot Co. at gotexan.org. Special thanks to Caiden Fenoglio and the Fenoglio Boot Co. for all the insightful information. For more information on their boots or If you’d like to order a pair of scheduling a tour of their facility, visit personalized boots from Fenoglio Boot their website. Co., it pays to know what time of year to place your order. TEXAS GRAPEFRUIT FUN FACTS • Texas red grapefruit was designated the official state fruit of Texas in 1993. • The Ruby Red was the first grapefruit to be granted a U.S. patent. • The National Cancer Institute placed grapefruit on their list of cancer preventative health foods. • Texas produces approximately 27,000 acres of citrus every year. • TexasSweet.com says red grapefruit, which has become very popular today, was accidentally discovered in 1929 by Texas citrus growers. They found red grapefruit growing on pink grapefruit trees. This grapefruit became known as the Ruby Red grapefruit. JOE DADDY’S: ADDING ONE MORE JOE TO THE LIST Joe Daddy’s general manager, Dallas Hagar, said the restaurant and its name came together in 2013 after success with two other restaurants — Mac Joes and Joe Taco — in the Amarillo region. “Every day we have people ask us, “Who is Joe?” Hagar said. “The truth is that there is no Joe. We kept the name of a preexisting restaurant that we bought, Macaroni Joes, and we decided to put Joe on all the restaurants that we have opened since.” Despite the absence of someone named Joe working there, Joe Daddy’s isn’t missing anything else. With a great selection of Cajun food, amazing chicken fried steaks, creative pastas and salads, it’s a sure bet that even the pickiest of eaters can find something delicious to eat at Joe Daddy’s. FOUR BULLETS BREWERY: FROM THE KITCHEN TO THE BREWPUB Long before Four Bullets Brewery was an established beer factory, Jeff Douglas and Andrew Smeeton were brewing beer in Jeff’s kitchen. That was in the early 2000s. Smeeton, who hails from England, had been brewing beer for about 30 years before that. In May 2015, the doors to Four Bullets Brewery officially opened in Richardson, Texas. Smeeton and Douglas came up with the name after a night of playing poker and drinking one of their craft beers. same great-tasting English Brown Ale we started with originally.” Four Bullets Brewery usually focused on brewing English style ales, but the brewery is looking to amplify their craft beer menu and branch out to try creating different flavors. Douglas along with his master brewer and partner, Smeeton, believe that buying locally in Texas is very important. Douglas said that Four Bullets Brewery will continue to focus on making top quality handcraft beers, while simultaneously ensuring the quality and importance of their craft remains a top priority. As for Douglas’s personal favorite beer from Four Bullets Brewery? That would be the Black Jack Brown Ale, an English-style brown ale that’s smooth and malty with a hint of caramel and sweetness. “No matter what the circumstance is never forget your customer and how much the quality of your final product matters,” said Douglas. COLOR ME GREEN NURSERY: OUT OF RETIREMENT AND INTO BUSINESS After working in the mortgage business for more than 35 years, Lucy Wootan decided that it was time to retire. Since Wootan was already an avid gardener in her spare time, it was a no-brainer for her to take her hobby and turn it into aside business. Wootan carries a variety of plants including succulents, cacti, pecan trees and so much more. Really, you’ll find anything you might need for gardening in her nursery. In 2008, Color Me Green Nursery in Floresville, Texas, was established. Wootan said eight years later, her nursery has really grown, no pun intended. and she was about ready to give up. “Buying products or goods locally helps build up our community and supports small business owners like me,” Wootan said. “I thought, well maybe it’s time to close down the shop,” Wootan said. “But my brother, who is in the nursery business himself, convinced me to persevere and When asked what the best thing about her line of work was, Wootan keep my nursery going.” responded that the people she interacts with are the best part of her job. Wootan said in Floresville, a lot of the local “mom-and-pop shops” are being taken over by chain stores, but she still “I’ve made a lot of friends through this business,” Wootan said. “I think that feels it’s important for consumers to people who garden are just good and buy locally. honest people. In the eight years that I’ve been in operation, never once has a check bounced from a customer.” Wootan has been a GO TEXAN member for several years now. She said that she became a member, because she liked what the GO TEXAN representative had to say and what the program stood for. Although she said her business is a small operation, she really enjoys it and will keep doing it for as long as she can. “I like to help my neighbors and friends make their yards green and more colorful, which is why I named my business Color Me Green Nursery in the first place.” If you’re interested in visiting Color Me Green Nursery, visit Wootan and her shop at 2962 U.S. Hwy. 181 N in Floresville. Her hours of operation are Fridays from 10 a.m. to 6 p.m., Saturdays from 10 a.m. to 5 p.m. and Sundays from 10 a.m. to 4 p.m. RECIPE: COFFEE MARINATED VENISON WITH PECAN SWEET POTATOES AND HORSERADISH CREMA Looking for an in-season recipe that’s out of the norm? You don’t have to hunt for a great venison recipe; we have the perfect one right here for you. The coffee marinade wakes up your tastes buds and the crunchy pecans make the potatoes and this recipe extra special. potato is cooked through. Set aside. 5. Coat venison filets with remaining olive oil and coffee; season with salt and pepper. 6. On a medium-hot grill, cook venison Venison Directions: filets for 3 to 4 minutes on each side, or until medium rare or desired 1. Cook diced potatoes in boiling water for 10 to 12 minutes or until soft. temperature. 7. While the venison cooks, combine in a 2. Transfer potatoes to a mixing bowl. Add 1/4 cup of sour cream, heavy cream, bowl 1/2 cup of sour cream, horseradish and Worcestershire sauce. butter and chipotle purée. Mash until mixed, and season with salt. Set aside. 8. Season with salt and pepper. 3. On a small plate, add 2 tablespoons of 9. Divide mashed potatoes onto 4 plates, olive oil and coat the sliced sweet potato, place a venison filet on each plate and and season with salt. garnish with roasted pecans and grilled sweet potato slices. 4. Grill each side of the sweet potatoes for 2 minutes, turning as needed until Chipotle Purée Directions: 1. Buy chipotles in adobo sauce, place in blender and purée until smooth. Refrigerate until ready to use. 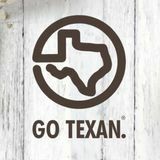 Grab your mobile devices and cameras and send us pictures of the GO TEXAN mark — on products on the shelf or in your hands, on signs, vehicles or printed materials. Get creative! Prizes include GO TEXAN t-shirts, glasses and hats. To enter, tell us where you saw the product and GO TEXAN mark, and post your photo (be sure to use the We will judge your social media post #GOTEXAN hashtag) on Facebook, or emailed photo based on originality, Instagram or Twitter. We will share creativity, composition, the “fun factor” your posts and select winners once and, occasionally, we’ll randomly pick per month. You may also enter by winners! If you win, we will notify you emailing us your photo. that we’re about to send you some stylish GO TEXAN swag. Have fun ... and happy hunting!